Tarantino once considered releasing Kill Bill as one whole movie, playing it as two two-hour parts with an intermission between them. He decided against this idea though. My own intermission lasted for several years, and as I watched Kill Bill Vol.2 a couple of nights ago, I had to strain to remember some of what happened in Vol.1, or even guess what must have happened during the previous stages of The Bride’s revenge quest. 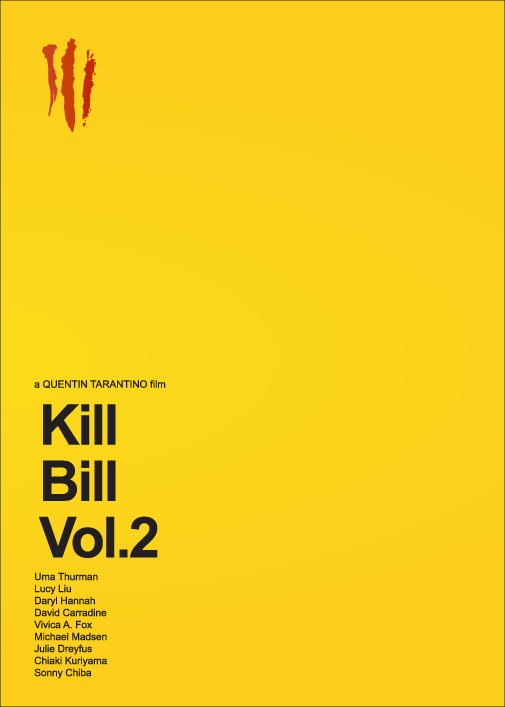 Anyway, I suppose separating the two parts as physically independent movies was a good decision by the director, as Kill Bill Vol.2 holds its own as a film of its own. Of course, it’s best to make sure you start at the beginning and see Vol.1 first, so that you get familiar with the intentions of this double header as a tribute to genres and pieces of cinema history that Tarantino has been in love with for all of his life… and as an attempt to create a mythical world that feeds on the classics but has a distinct personality and a life of its own. I am one of the people who like the vignette style of Tarantino. Many slate him for various reasons, but – love or hate the guy – he’s a good entertainer and a great supporter of cinema. Vol. 2 is stylish in its emotionality and generous with its characters. Maybe not with its heroes, but definitely with its characters. In his scripts, Tarantino may kill people without compassion, but I don’t think he kills them without glorifying either their personality, importance to the story, or – at the very least – the extremely graphic and/or amusing way they depart. It might be cruel to an extreme to leave a central character eyeless and screaming with pain and powerless fury into a trailer inhabited by a super-deadly black mamba. But if you talk about mythology, it’s hard to underestimate Elle Driver’s (Daryl Hannah) powerful presence and it’s equally hard to forget the character she created. So negative critics (whom Tarantino actually seems to like as a breed) probably should not be so hard on the writer and director. At the very least, there aren’t many like him left in the movie business. I’m a supporter of the view that, even if you can’t find in a movie anything that will enrich you spiritually, anything you can learn from, but if that movie genuinely entertains you – it’s worth it. Vol. 2 entertains, has fresh ideas on old movie cliches, every shot is constructed beautifully, and all characters will stick with you for a long time. Some of them – Beatrix Kiddo a.k.a The Bride (Uma Thurman, for whom Tarantino wrote the part exclusively), and Bill (the late David Carradine, what a loss), could very well stick with you for even longer. It’s much more thoughtful and in a way, slow-moving than the action-and-blood-filled first part. But in no way is it less of an entertainment.